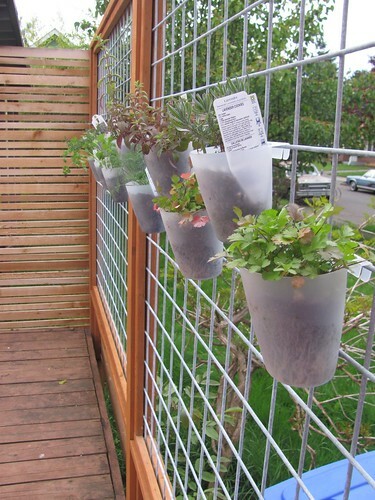 New Wave Domesticity: A simple vertical garden! I recently moved into great cute little pink house and it is slowly, but surely starting to feel a lot like home. After living in several duplexes, it is really nice to have a real house with a yard and deck to ourselves. This is the first time I've felt like I really had the space to tackle making a real garden, so I am really excited about that! I've spent a lot of time learning, digging, and shopping for plants lately. One of my favorite parts of my outdoor space is our vertical herb garden. It is a fantastic space saver and adds a fun element decoration to the patio. It was also really inexpensive to create! The side of our patio has a metal grate that I really wanted to be able to utilize in some way and dress up just a bit. I had bought some Bygel containers from Ikea to store pens in my craftroom, but I realized that they might actually be exactly what I needed for the patio! 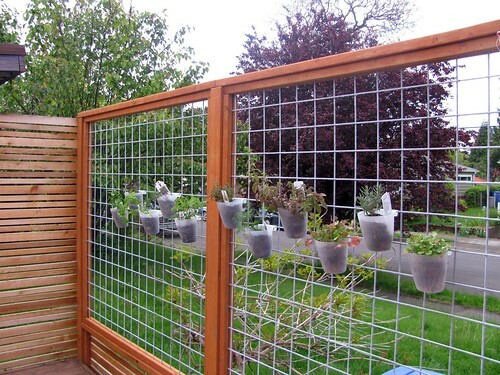 The Bygel containers fit perfectly onto the metal grates and they already have 3 holes drilled in the bottom, so they drain well and are perfect for plants! And for 99cents each, this project is super simple and fits any tiny budget! 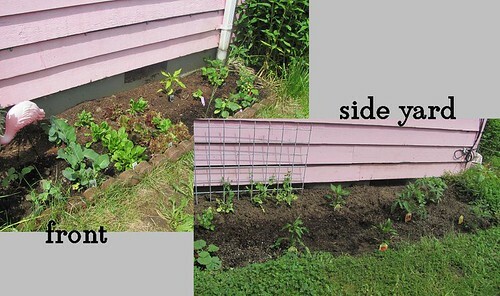 I imagine most people aren't lucky enough to have this grate system in their backyard, but these Ikea gems could be also be used with these rails (as they are in my craft room), fences, or maybe a nice heavy trellis of some kind? You could definitely set this vertical garden up indoors near a window, but just keep in mind that you would need a system to catch the water that drains from your plants. I have always been really unsuccessful with plants in the past (I always thought I had a "black thumb"), so I am extra delighted that all of my plants seem pretty happy and are growing well! We currently have about 10 types of herbs growing right outside our kitchen door and it has been so wonderful to be able to easily add some freshness into my dishes. I am looking forward to a summer full of trying some new herb recipes. I also dug a few various small beds for planting veggies. I have about 30 various varieties of vegetables growing around the yard and so far they are mostly all doing quite well! My tomato, peppers, and squash have already started to flower and we are getting harvests of spinach and lettuce any time we need it. The strawberries are slowly, but surely turning from green to juicy red. I am really excited to be growing my own food...it's so empowering and I am surprising myself with how easily I am able to it! I am so excited for summer when my plants start to produce and I can try out some new recipes!